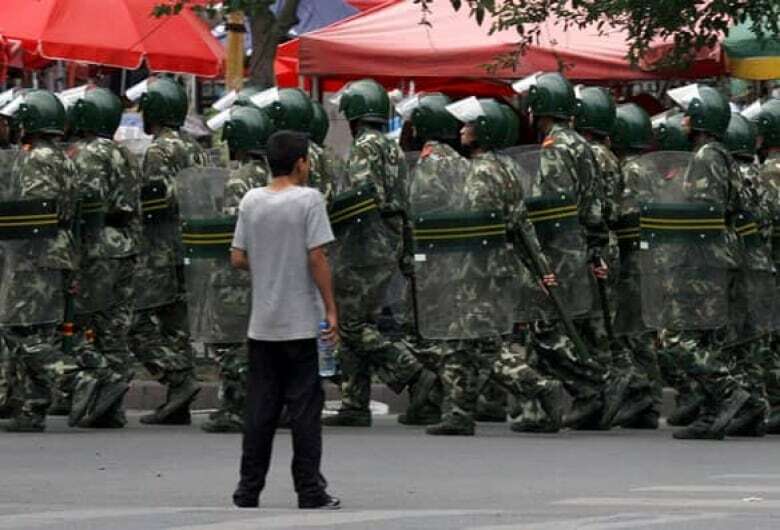 The Chinese government blocked access to cellular service and internet sites in some cities in the country's northwest province of Xinjiang on Monday, the second day of deadly rioting between government forces and members of the ethnic Uighur minority. A local boy watches Chinese soldiers wearing riot gear march in formation as they patrol the streets of Urumqi, Xinjiang Autonomous Region, in China on Monday. ((David Gray/Reuters) ) The Chinese government blocked access to cellular service and internet sites Monday, the second day of deadly rioting between government forces and members of the ethnic Uighur minority in the northwest province of Xinjiang, according to Chinese state media. The official Xinhua news agency also reported that police have arrested 1,434 people in connection with the violence that left at least 156 dead. The agency didn't provide further details. 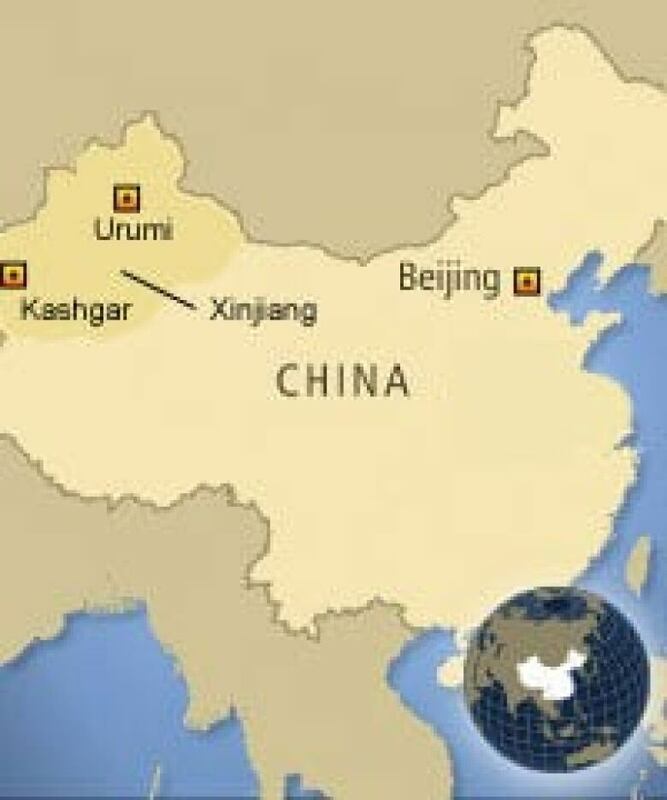 Protesters from the Uighur ethnic group took to the streets in the city of Kashgar in northwestern China on Monday, a day after a demonstration in Xinjiang's capital of Urumqi turned into a lethal riot. A Uighur man in Kashgar said he was among more than 300 protesters who demonstrated outside the Id Kah Mosque late Monday afternoon, The Associated Press reported. He said police surrounded them, and the two sides were yelling at each other, but there were no physical clashes. A man with head injuries lies on the ground on a street in the city of Urumqi in China's northwestern Xinjiang region in this video frame released by the government on Monday. 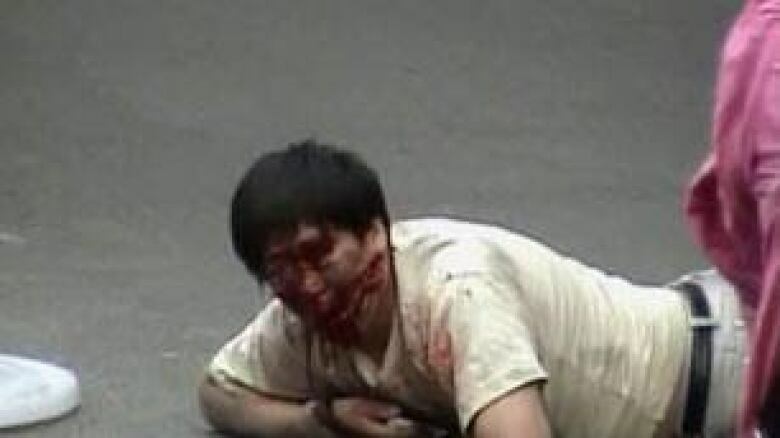 ((Reuters))Chinese state media said that along with the dead, 828 people have been injured in the riots. The Uighurs — an ethnically Turkic, predominantly Muslim group — make up the majority in Xinjiang, a region in northwest China bordering Central Asia and Mongolia. Their relations have often been tense with the ethnic Han Chinese who predominate in the country as a whole. Many Uighurs feel they're discriminated against by the government in Beijing, and a Uighur separatist movement has existed for decades. Alarmed by the reports of violence and deaths, Canadian Foreign Affairs Minister Lawrence Cannon issued a statement Monday calling for restraint from both sides. "Dialogue and goodwill are required to help resolve grievances and prevent further deterioration of the situation," he said. While there have been no reports of Canadians in the region, the department advised others travelling to the region to exercise "heightened caution" and to inform consular officials of their plans. Exiled Uighur leader Rebiya Kadeer on Monday denied Chinese government accusations she helped incite the riots. Kadeer is the president of the Uighur American Association (UAA) and has lived in Fairfax, Va., since she was exiled from China in 2005. In an interview, Kadeer says she only called her family in China to warn them to steer clear of upcoming protests that she heard about on Uighur and Chinese websites. (CBC) The protests started in the provincial capital of Urumqi on Sunday, when demonstrators gathered to demand justice for two Uighurs killed in June during a fight with their Han co-workers at a factory in southern China. The protests turned into the deadliest ethnic unrest to hit the region in decades. Photos and video posted on the internet showed the city in flames, as rioters went on a rampage, clashing with police and rolling over police cars. Chinese television showed pictures of severely beaten women with blood gushing from their faces, CBC's Anthony Germain reported. The state media reported large mobs carrying knives, wooden batons and bricks gathered last night and started to attack passersby. The reports claimed the mob started to torch businesses and shops in the area. "There are no details of the police response to the violence but in Xinjiang, the Chinese police often react swiftly and with deadly force," Germain said. Some streets remained blockaded and armed police were on patrol attempting to restore order. Many Uighur organizations claim Beijing persecutes Muslims with the aim of wiping out their religion and allege none of the jobs in the region’s lucrative oil industry ever go to Muslims. The Communist government has said it is trying to snuff out terrorist activities in the region and is blaming the riots on what they call "Muslim traitors," who the government claims are trying to destabilize the country.